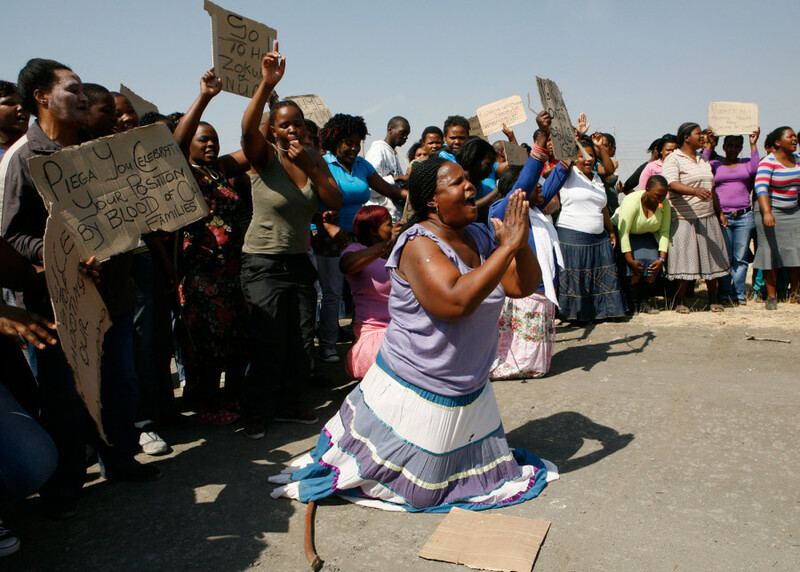 An unidentified woman cries as women protest against the police near the scene of the shooting of miners on Thursday at the Lonmin mine near Rustenburg, South Africa, on Aug. 17. Police chief Mangwashi Victoria Phiyega says 34 miners died and another 78 were wounded when police opened fire on strikers in one of the worst police shootings in South Africa since apartheid. 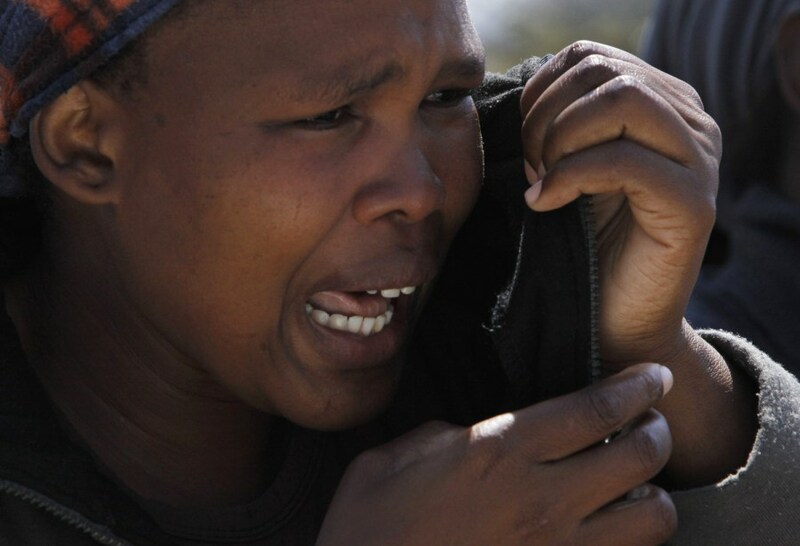 An unidentified woman cries on Aug. 17, as she protests against the police opening fire Thursday and killing and injuring striking mine workers at the Lonmin Platinum Mine near Rustenburg, South Africa. Reuters -- MARIKANA, South Africa -- The police killing of 34 striking platinum miners in the bloodiest security operation since the end of white rule cut to the quick of South Africa's psyche on Friday, with searching questions asked of its post-apartheid soul. Newspaper headlines screamed "Bloodbath", "Killing Field" and "Mine Slaughter", with graphic photographs of heavily armed white and black police officers walking casually past the bloodied corpses of black men lying crumpled in the dust. The images, along with Reuters television footage of a phalanx of officers opening up with automatic weapons on a small group of men in blankets and t-shirts, rekindled uncomfortable memories of South Africa's racist past. Police chief Riah Phiyega confirmed 34 dead and 78 injured after officers moved in against 3,000 striking drill operators armed with machetes and sticks and massed on a rocky outcrop at the mine, 100 km (60 miles) northwest of Johannesburg. 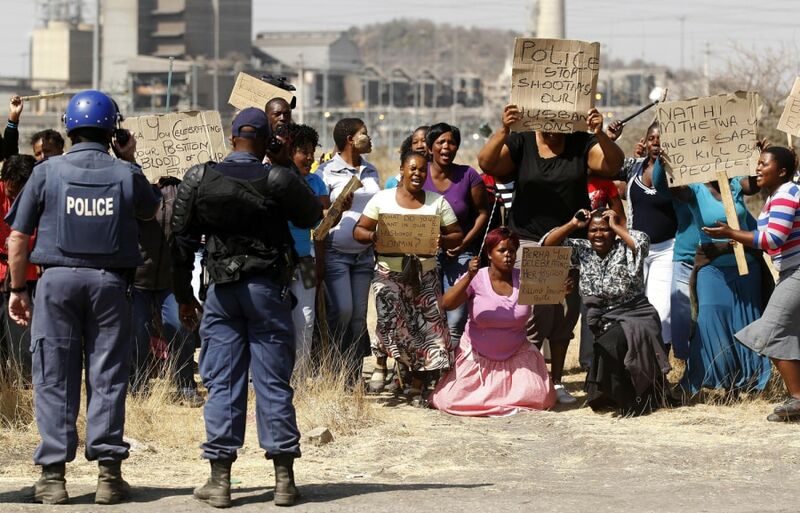 Policemen look on as women carrying placards chant slogans in protest against the killing of miners by South African police on Thursday, outside a South African mine in Rustenburg, 62 miles northwest of Johannesburg, on Aug. 17. South African Police were forced to open fire to protect themselves from charging armed protesters at the Marikana mine, and 34 of the protesters were killed, Police Commissioner Riah Phiyega said on Friday. She told a news conference that 78 people were injured and 259 arrested in Thursday's violence. After a violent pay dispute left 34 dead and 78 injured in South Africa, Police say they were "forced to use maximum force to defend themselves." ITN's Neil Connery reports.